The new U.S. Environmental Protection Administration plan to reduce coal-fired power plant carbon emissions through operating power plants more efficiently rather than closing them is good news for Vermonters and other New Englanders concerned about possible cold weather-related power blackouts. On August 21, EPA proposed the Affordable Clean Energy (ACE) rule to help states reduce greenhouse gas emissions from existing coal-fired power plants. 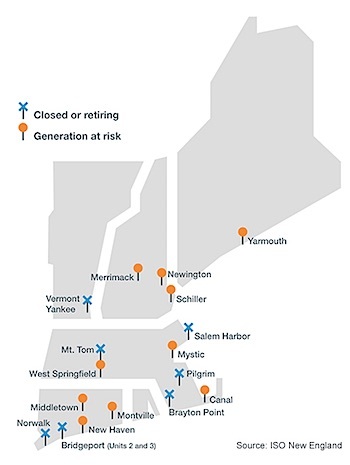 The New England power generating stations, comprising about one-sixth of the region’s capacity, have either closed since 2013 or are expected to close within three years. Many are coal-burning power plants that play a vital role as a backup power source preventing blackouts on very cold winter days. Following the guidelines would reduce U.S. coal plant emissions by an amount equivalent to taking five million cars off the road, the EPA predicts. When states have fully implemented the rules, U.S. power sector carbon emissions could be two-thirds lower than 2005 levels. The ACE rule would replace the Obama-era 2015 Clean Power Plan (CPP), which EPA has proposed to repeal because it exceeds statutory authority. The U.S. Supreme Court agreed, freezing CPP implementation in 2016. “In promoting the plan, the [Obama] EPA repeatedly emphasized that the CPP represented the most ambitious climate-related undertaking in the agency’s history and crowed that the plan would lead to the complete restructuring of the energy sector,” lawyer Jonathan Adler wrote in the Washington Post. If it weren’t for January, New England wouldn’t much need its coal plants. Spread out over the 12 months of the calendar, they make just 1.6 percent of the region’s power. But during the frigid first month of the year, coal is very important. For example, this year more than half of all coal-fueled power was dispatched during January. Sub-zero temperatures diverted much of the region’s natural gas supply to heat buildings. With other power sources (hydro, nuclear, biomass wind, solar) already at peak output or suffering weather-related failures, power grid operator ISO–New England turned to oil and coal for vital back-up power. In January alone, ISO-NE kept the lights (and electric-powered furnaces) on with 415,000 megawatt-hours of coal power – the equivalent output of a 47 megawatt power plant operating 24/7/365. At peak demand during the coldest days, coal supplied a steady 5-7 percent of the region’s power, with “backup” oil-fired plants picking up most of the slack caused by the natural gas shortage (see graph, page 31). Had those coal and oil plants gone offline, deadly blackouts would almost certainly have ensued. During the Deep Freeze, solar and wind power combined produced less electricity than coal. Coal was also the cheapest fuel source during the freeze. Since Jan. 31, ISO-NE has dispatched just 370,000 MW hours of coal. In baseball parlance, coal is the pinch-hitter who sits on the bench most of the time but when the game is on the line, you’re glad he’s ready. Even before the Obama CPP targeted coal power for extinction, New England’s coal power plants were in decline, due in part to very low natural gas costs. The ISO-NE graph above shows coal, oil and nuclear plants either closed or expected to close from 2013-21. ISO-NE has put New England’s political and energy leaders on notice: the more nuclear, oil and coal plants you allow to close, the thinner the bench and therefore the more likely New England will suffer a catastrophic blackout. Although the renewable power industry – competitors of coal – says ISO-New England has overstated the likelihood of a blackout, five New England governors (including Vermont Gov. Phil Scott) apparently got ISO’s message. They issued an Aug. 12 statement prioritizing low-carbon power generation like hydro, off-shore wind and nuclear power. They note the region has been increasingly reliant on backup coal power and said “The states are committed to use the tools within their jurisdiction to advance solutions to the winter fuel security issue.” But the governors also insist each state must do what it thinks best. Gov. Scott, facing re-election against renewable power advocate and former utility executive Christine Hallquist, yesterday called the EPA plan “simply the wrong approach” and instead would cut emissions with improvements in power generation, transportation thermal heat, and conservation. Vermont has no coal-fired power plants. The closest operating units are in Merrimack and Portsmouth, NH.